The Obama Foundation announced in 2016 that the Obama Presidential Center would be located in Jackson Park, a site the University suggested. Now, over two years later, the location remains untouched: wide, grassy spaces and baseball fields. Due to a slow federal approval process, the groundbreaking for the Center has been postponed to 2019. The Presidential Center—Obama’s version of the presidential library—will consist of three buildings wrapped around an open-air plaza. A museum will feature exhibits related to the Obamas, African-American history, Chicago history, and American history more broadly. Across the plaza will be a 5,000-square-foot public library, part of the existing Chicago Public Library system. The third building will be a community meeting space. The complex will also include an athletic center. The Obama Foundation estimates that the Center will attract between 625,000 to 760,000 visitors annually and create over 3,000 jobs across construction and on-going operations. They predict the Center will generate 2.1 billion dollars for the South Side economy over a 10-year period. The City Council voted 47–1 in favor of the Center. However, citizen response to the project has been mixed. In May, Chicago nonprofit Protect Our Parks, Inc. filed a lawsuit against the Park District and the City. In the lawsuit, the group seeks to forbid the Parks Department from approving the Center. The organization argues in its lawsuit that the University of Chicago's bid to use historic park land protected by preservation laws would be a violation of federal and local policy. They claim the Foundation pulled an “institutional bait and switch” by initially advertising the Center as an official presidential library, rather than an independently-managed three-building complex. 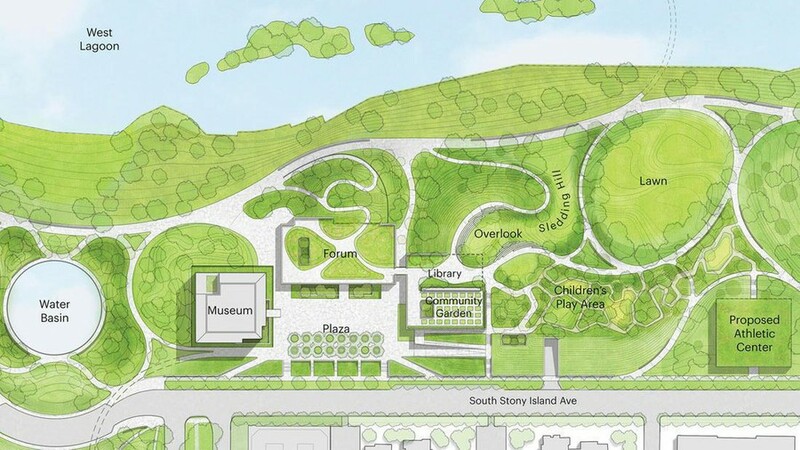 In a hearing on August 14, District Court Judge John Robert Blakely agreed to let the plantiffs obtain information from the city of Chicago and Obama officials on how the Jackson Park site was selected. University of Chicago faculty have also weighed in on the public land debate several times. In January, nearly 250 professors signed a letter calling for the Center to be built in a location other than Jackson Park. They argued that preserving public land in city spaces should be an imperative and that building the Center would compromise the vision of the park’s original architect, Frederick Law Olmstead. The letter also expressed support for a Community Benefits Agreement (CBA): a legally binding document that would hold the Foundation accountable to the communities bordering the park. CBA advocates are concerned that the presence of the Center would raise rent prices in the area, driving low-income residents out of the neighborhood. The Obama Community Benefits Agreement Coalition is a group of seven South Side activist organizations, including a group of University students. They demand that the Center employs local citizens and supports residents in danger of displacement. The Coalition also outlines two dozen “development principles”: goals to improve everything from education to nearby public transportation. “We have a right to not be displaced out of our communities, and it’s unreasonable for Black people to not get the permanent and construction jobs when the Obama library comes,” Parrish Brown, an activist with the Coalition, said at a March protest. The Coalition has also urged the University and the City of Chicago to sign CBAs, as parties to the development of the Center. Both have resisted. When asked about the CBA, former president Barack Obama has argued that the Center is for the good of the community, and that his motivations are pure. He also has expressed concerns that no CBA could adequately represent everyone involved: “If we sign with one, two, or five organizations, they're not representing everybody on the South Side. Next thing you know, you've got 40 or 50 organizations—all wanting to be decision makers. We're not going to do that." Hours before the meeting started, both supporters and opponents of the proposals gathered outside City Hall, where they passionately chanted in favor of their respective sides.